Gutsy game casserole and fragrant, buttery juniper cabbage make the most of seasonal ingredients. Preheat the oven to 180°C, gas mark 4. Mix the game with the flour and a little seasoning until evenly coated. Heat 2 tablespoons of the oil in a flameproof casserole dish and fry the onion and garlic for 2-3 minutes over a low heat, until softened. Add the game and fry for 3-4 minutes, until starting to turn golden, stirring constantly to prevent the meat sticking. Pour in the wine and add the bay leaf, carrots and mushrooms. Cover, transfer to the oven and cook for 45-50 minutes. Towards the end of the cooking time, heat the remaining oil in a frying pan and add the whole, peeled shallots. Fry for 3-4 minutes, until golden. Remove the stew from the oven and add the shallots. Return to the oven and cook for a further 25-30 minutes, until the meat is tender and the vegetables are cooked. Place the cabbage in a steamer and cook for 4-5 minutes, until softened but still retaining a little bite. Place in a serving dish. Melt the butter and crushed juniper berries together in a small saucepan over a low heat. 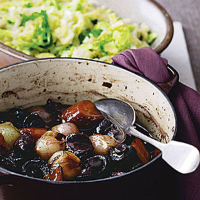 Drizzle the butter over the cabbage, season and serve with the game stew and a pile of creamy mash. Don’t overcrowd the pan when frying the game, as the meat will steam rather than brown. Cook in batches if necessary. Savigny-lès-Beaune Bouchard Père et Fils, a full-bodied Pinot Noir from Burgundy, will complement the gutsy flavour of the game.